An Occupational Safety and Health Administration (OSHA) program that gives special treatment to businesses with good safety and health records may be leaving workers vulnerable to on-the-job hazards, according to a new Government Accountability Office report. The program takes lots of money to implement (money the Bush administration was more than happy to redirect from more traditional enforcement efforts) but doesn’t do nearly enough to protect workers. OSHA established the Voluntary Protection Program to certify businesses with exemplary safety records. Applicants to the program must show that their injury and/or illness rate is below the industry average, and they must have in place management systems that actively work to control and reduce hazards. Once enrolled, businesses are subject to less frequent inspections. As of 2008, 2,174 sites were enrolled, according to GAO. But the program may not be working as intended. GAO criticized OSHA, as well as state regulators, for failing to check up on facilities in the program after an on-the-job death. Many businesses are simply allowed to remain in the program with no threat of punishment. For example, one site had three fatalities in a five-year period, but program managers said the business could remain in the program until its next scheduled inspection. For the most part, the problems can be traced back to management at the federal level. OSHA does not require sufficient documentation of workplace incidents nor does it adequately instruct and monitor state regulators, according to GAO. According to White House Office of Management and Budget figures, OSHA currently has $73 million at its disposal for “compliance assistance” which includes funds for the VPP. Under President Bush, OSHA’s budgets for enforcement, standard setting, and research all declined or held steady. Compliance assistance, on the other hand, saw a hefty increase, up from $46 million in FY 2000. Based on his budget request, President Obama appears to want to take OSHA in a new direction. 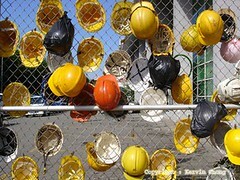 OSHA would see a seven percent increase in FY 2010 under Obama’s plan. That includes double-digit percentage increases for the standard setting unit and for enforcement. Meanwhile, Obama has proposed to hold funding flat for compliance assistance activities. Image by Flickr user Kervinchong, used under a Creative Commons license.